Sigrid Sandström, Viewfinders. 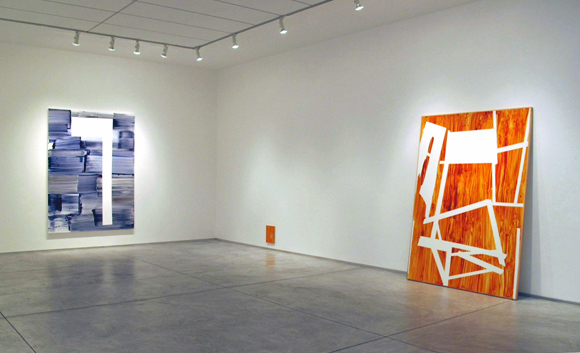 Installation view; Inman Gallery, Houston. Inman Gallery announces Sigrid Sandström: Viewfinders, an exhibition of new paintings by the Stockholm-based artist. Viewfinders is Sigrid Sandström’s sixth solo exhibition with the gallery since 2002. It will be on view January 11 through February 16. Viewfinders comprises a group of acrylic paintings on board or panel. In these untitled works from 2010–12, Sandström layers a variety of contrasting painterly marks and abstract forms. The result is an uneasy spatial interplay highlighting the processes of painting and viewing as unresolved experiences. Sandström’s works elicit encounters with painting as an unsettled optical and physical space. In her early paintings Sandström depicted precarious landscapes, imaginary places reminiscent of the glacial topography of her native Sweden. Evoking the sublime realism of Romantic painters, the compositions are vertiginous and bleak, feelings Sandström heightened through the use of expressive paint handling and the rendering of pictorial elements as abstract shapes. Using increasingly geometric and less representational imagery, Sandström began suggesting other places in her works: the artist’s studio as well as the compositions of non-objective painting. Her arrangements of blocks of color recall accumulations of torn paper and masking tape as if leftovers from her working process, evidence of a hands-on and inquisitive investigation of the history of abstraction. In the recent works on view here, Sandström approaches her paintings as an exclusively painterly space, with the forms therein referring to nothing besides the materials and process of their creation. Rather than represent a specific geographic place, she presents these paintings as a particular and dynamic place in and of themselves. The works typically have backgrounds streaked with translucent applications of brushed or squeegeed paint. Onto and into these washy fields, Sandström places similarly painted shapes, or more opaque, solid-colored blocks and bars. These fragmentary quadrilaterals are almost always irregular, with edges that are straight, curved, or jagged, but always sharp, as Sandström produces each by a process of masking. Building each work in a slow accumulation of additions, reconsiderations, and erasures, she layers these shapes into compositions that slip between two-dimensional flatness and the illusion of three-dimensional depth. Some painted shapes look like pieces of paper collaged onto the painting’s surface, while others can appear as pieces of paper caught at odd perspectival angles, as though in a windstorm. Bar shapes uncannily resemble strips of the masking tape used to create the sharp edges of her forms, provoking further feelings of visual cohesion, negation, and uncertainty. Such gestures teasingly evoke the action, potential, and skepticism of an in-process painting. White shapes, in particular, pose a conundrum. White areas would seem to depict blank space, a pictorial void, but Sandström actually paints each over the surrounding area that would appear to contain it, and thus each also acts as a solid presence. Throughout her works painted elements simultaneously jut and recede, as well as obscure, delimit, and cancel out each other. The occasional translucent shape epitomizes this indeterminate relationship: Sandström at once invites deep looking and holds the viewer at a distance. In a similar sense, her paintings here can be understood via the exhibition title as viewfinders. In each work Sandström fixes attention to the particular compositional dynamics of the parts of the painting, while also placing the viewer perceptually in relation to the painted image and the painting object, as well as the act of painting. Sigrid Sandström (b. 1970) currently lives and works in Stockholm. Sandström earned a B.F.A. from Academie Minerva, Groningen, The Netherlands (1997) and an M.F.A. from Yale University, New Haven, Connecticut (2001). Sandström’s paintings are in the public collections of the Moderna Museet, Stockholm; the Museum of Fine Arts, Houston, Texas; and the Yale University Art Gallery, New Haven, Connecticut, among others. In 2008 she received a Guggenheim Memorial Foundation Fellowship and a Joan Mitchell Foundation Grant. She is currently a Professor of Fine Arts at the Royal Institute of Art, Stockholm.